The Arequipan Experience. - The Sheona Experiment. While most of us senselessly survived the notorious heat wave grooving to the hottest 100 in our kiddie pools, for some, the summer that saw 2013 ombré into what is now 2014, was a whole lot more experiential, and dare I say, life-changing. A girl I met in a Spanish tute during week 1, specifically had one of these. As we rattled off the usual “Hola, ¿Como te llamas?” of these types of introductory tutorials, our exhausted formalities were replaced by exuberant talks to a summer that will surely be, ‘told to the kids’ of my new, blonde-haired altruistic friend. Having just arrived home after a volunteer residency, in Peru, my drilling her of questions was axed by a time-pressed tutor. Thankfully, an unusually useful Moodle, allowed me to track her down, send a random facey add, and explore her experience further. Here are my findings for your perusal, should you coincidently be on the look out, for some volunteer acumen and inspiration. Duration of Volunteer-ism: 4 months. Why volunteer, Mel? To travel, get some new experiences, to learn a language, or to accumulate great karma? To experience life in a third world country and try and help as best as I could. I also wanted to travel around Peru and learn Spanish. What were your top 3 best experiences whilst volunteering? 1. Starting a dental project in a village 3 hours out of Arequipa, and seeing the kids receive the dental treatment they desperately needed. 2. Translating for a Medical Project in the Colca Region. What were the worst 3 experiences whilst volunteering? 1. Feeling helpless when looking at the big picture. 2. The 1-hour cramped bus ride to the project every day. 3. Leaving the kids at the end. In retrospect, what lesson did you learn either from your volunteer leaders, the local adults or kids? I learnt that harsh living conditions do not always equal an unhappy or unsafe family and that it is amazing what joy small things can bring to children. Where was your happy place while volunteering? (Under a tree, by the lake, at the beach, sitting with the children, flirting with Pedro at the bar?). In Coporaque where I worked on weekends I would go down to the natural hot springs at night with a couple of the children I taught, and we would play in the river and look at the stars. I would love to go back to the kids in Peru in a couple of years to see how they are going. Also I would like to teach Aboriginal kids in Australia because while I loved working and teaching in Peru it got me thinking about what I could do to support people in my own country. Maybe once I finish my degree I will find a volunteer placement in Australia. Any advice for someone wanting to volunteer? Look up websites where you don’t have to pay to volunteer! It is very uncommon for an organization to be completely volunteer run like Intiwawa. Normally you have to pay ridiculous amounts of money for administration costs, which I don’t think is what volunteering should be about. Unfortunately, Intiwawa only runs in Peru so if you are looking to go somewhere else I would research companies that are volunteer run. Did you notice any sort of activism where you were volunteering, if so, what about and what were the perspectives of activists compared to the locals or those affected? In Arequipa, locals would strike multiple times a week for better wages and better work-care. I wouldn’t know what it was like for them but I do know that most of the parents that I knew in Peru would have liked better education for their kids and more opportunities for them to advance to tertiary level. 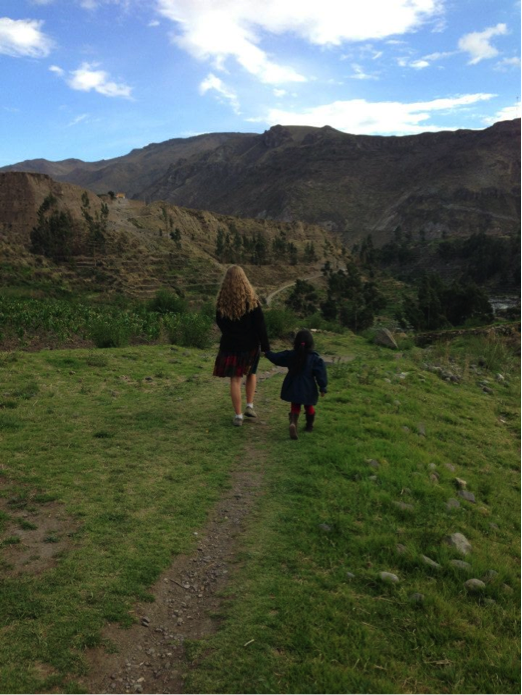 Our gal Mel (#rhyme), is beyond keen to brag even more about her amazing time in Arequipa and super happy to offer any advice to rookie volunteers. Get in touch through e-mail with: mgpev1@student.monash.edu. This article was published in Lot’s Wife Issue 2/2014.